I love attracting birds to my yard. Where we live we have lots of gold finches and hummingbirds that visit us in the summer time, as well as wrens and doves. They are really fun to watch, and I love setting out bird feeders for them. 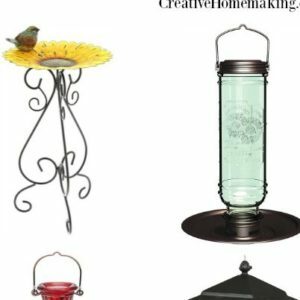 There are so many unique bird feeders to choose from that I have compiled a list of some of my favorites (who says you can have too many bird feeders?). Knowing what types of birds you are trying to attract will make a difference. I have different bird feeders for feeding gold finches and hummingbirds. If you live in an area where squirrels are a problem, you will even find squirrel proof bird feeders.